Dorthy Addie Crouch, 93, of Manila, passed from this life Tuesday, July 24, 2018, at the Flo and Phil Jones Hospice House in Jonesboro. Born in Marmaduke, she was the daughter of the late Marvin and Lorene Smith Roberts and was raised in the Leachville area. 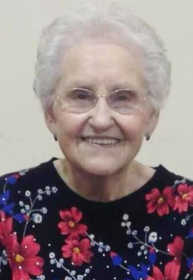 The widow of Doyle Crouch, she had lived most of her life in the Buckeye Community and was a former longtime member of the New Providence Baptist Church. She was a current member at Westside Baptist Church in Manila and was very active with the Manila Senior Citizens Center. Dorthy enjoyed sewing, dancing, and spending time with her family. In addition to her parents and husband she was preceded in death by six brothers, one sister and a grandson. Survivors include two sons, Gerald Crouch of Hornersville, Mo., and Robert Crouch of Stanton, Mo. ; five daughters, Sue Mullins of Manila, Norma Miller of Flushing, Mich., Carolyn Brymer, Wanda Gamble and Sharon Bunch, all of Manila; two brothers, Gene Roberts of Ludington, Mich., and Clarence Roberts of Davison, Mich.; one sister, Wilma Milligan of Newark; 17 grandchildren, 27 great-grandchildren, and 10 great-great-grandchildren. There will be a celebration of life at 11 a.m. Friday, July 27, at the Howard Funeral Service Chapel in Manila with Rev. Eddie Hawkins officiating. Burial will follow in the Manila Cemetery. Dorthy's grandsons will serve as pallbearers. The family will receive visitors Thursday evening from 6-8 at the funeral home.